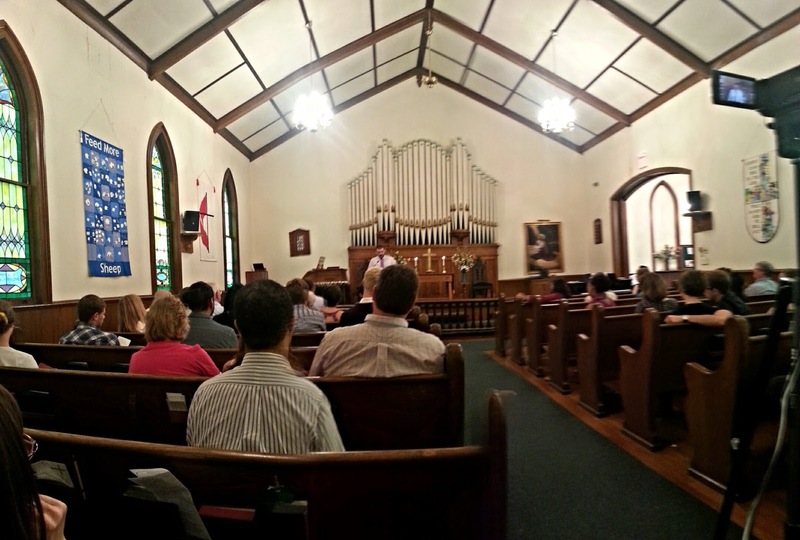 This Sunday was our first Sunday back at our church in Kingston since being gone in California for 2 weeks. It's so nice for us to be a part of a church that we look forward to going to each week. Besides the various "kick-off" ceremonies (for Sunday School, Internships, and our new music director), it was an ordinary service. Welcomed by piano music, joined by friends, called to worship with the proper degree of pastoral enthusiasm; we enjoyed the the things that have become our common Sunday morning ritual. But when we got around to the "Joys and Concerns" (or "Prayers of the People") portion--though it's become so familiar to me--I was struck by its awkwardness. At this church we take our time with joys and concerns. It's perhaps the most sacred time to us--an altar carved in time for people to offer the things that are going on in their lives, a space for us to lead one another in prayer. Our short service is sometimes almost dominated by this potion of our service. It's important to us because it creates a space for humans to be human together before God... simple yes, but that's essentially what church is in a nutshell. But while it is vitally important, it's also uniquely awkward. You can never be sure what people will say or how long they'll take to say it. You never know how drastically or dramatically the mood might change in just a few words. You just can't control it. And so, each Sunday, the Joys and Concerns portion of the service is where I become the most sensitive to the presence of new people. I wonder how awkward it feels for them. I wonder if they're confused about when the service will move along to the next thing, to the sermon, the offering even... I wonder if it makes them uncomfortable to listen to a bunch of people they've never met tell about the things they're facing and celebrating. Let's just say, if I were designing a "seeker-sensitive" service, this is not how I'd do it. But we cannot afford outreach at the expense of inreach. The church has to be insular. We need to be a witnessing community... but we are witnesses of the crucified Christ. The very thing to which we are witnessing is the affirmation of our humanity through its redemption and assumption into the life and being of God through God's incarnation in the crucified and risen Christ. The gospel opens a space for our stories to be held in God's story, for our anguish to be held in God's anguish, and for our joy to find its completion in Christ's resurrection from death and victory over hell. The church, as a witnessing community, is a community where human stories are held in God's story. The church is nothing if it is not a space for humans to be human together before God. The church is a community of resurrection that finds the very presence of God in the sharing of their own humanity. In the loving exchange of human stories and human relationships, the God we worship--the God in whose mission we're invited to participate--is present. That means that the very meaning of our mission, the basis of our outreach, is our relationship with one another in God's relationship with us as an inwardly-focused community--a community that takes its time on one another because it finds sacredness in humanity. Jesus did not say, "By this everyone will know that you are my disciples... if your church service is welcoming and comfortable for new people..." (although there's certainly a place for that). Jesus did say, "By this everyone will know that you are my disciples, if you have love for one another." The church is distinguished by its insularity, by it's ability to focus on, celebrate with, and even grieve among the gathered community. That's the only way to really be a witnessing community. I don't mean to overstate the point, though I'm open to the possibility that I really have. We must be missional! We must push outside ourselves to the community and to the world! We must love "others"!!! We must share the gospel!!!! But we have to do so as humans! Henri Nouwen wrote, “Somewhere we know that without silence words lose their meaning, that without listening speaking no longer heals, that without distance closeness cannot cure.” And Dietrich Bonhoeffer wrote,"Whoever cannot be alone should beware of community. Such people will only do harm to themselves and to the community." Just as words find meaning in silence and just as community comes from solitude, the church's outreach will come from its ability to be insular, to share themselves (their humanity) with one another. So that awkward and sacred time that our little church spends on sharing joys and concerns may not be the most profoundly comfortable time we share... it may not be extremely inviting right at first...but I've come to appreciate it as the most important thing we do on Sunday. You know, I have to agree. I may not necessarily agree with the what of your post: while this practice may "work" for your church's context, it may not be transferrable to other churches. And I would take issue with the why you propose: finding "sacredness in humanity" does not strike me as being biblical enough in its wording or reasoning. But I affirm the overall that: That the church must focus on itself--to the degree that Scripture prescribes--is a point worth making. Part of what I find objectionable about the seeker-sensitive movement is the unintentional-but-implicit devaluing of the church; to the seekers who come through the doors of the church, Seeker-Sensitives reinforce the message that "Except for the fact that we worship Jesus, we're just like you." I Peter 2:9 calls us a "chosen race, a royal priesthood, a holy nation, a people for his own posession," and Colossians 3:12 calls us "God's chosen ones, holy and beloved." There is something unique about the church that distinguishes it from the rest of the world. There is something about the church that deserves the church's attention. Great post, Wes. Spoke directly to my fears.